We're happy to report that Freedom works perfectly with Mac 10.14 Mojave - Apple's new operating system. You'll notice one difference when you run your first Freedom session on Mojave - you'll be asked to give Freedom permission to control Safari (or Chrome). You'll want to click "OK" here. By controlling the browser, we're able to redirect you from pages you want to block to our "Green Screen." And when we release our website exception feature (whitelisting) in the fall, it will also use these permissions. If you don't enable the permissions, Freedom will work, but you will not see the green screen. I hit "Don't Allow" - how can I change that? If you hit "Don't Allow", you can change that easily. 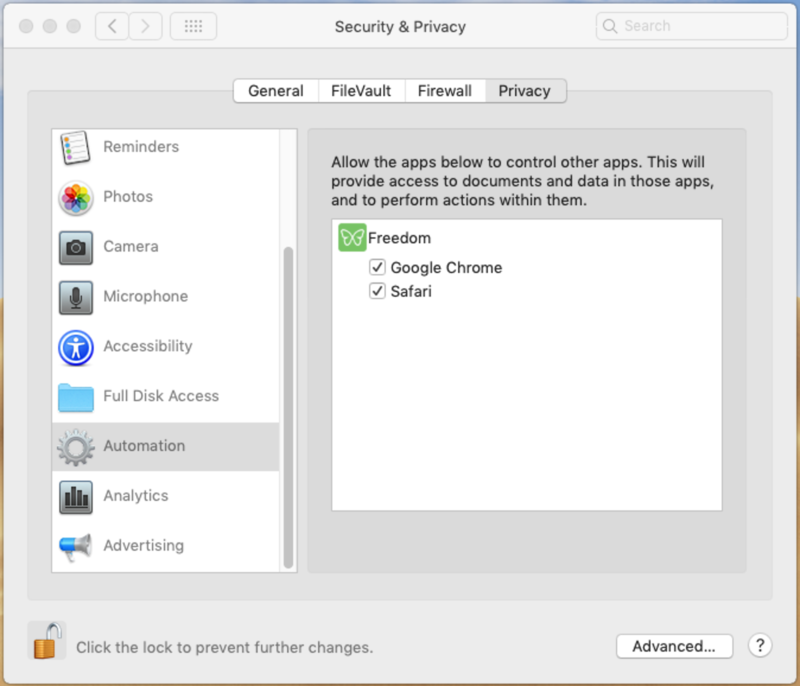 Open up System Preferences -> Security & Privacy -> Privacy -> Automation and make sure everything under Freedom is checked. Then restart Freedom. You will likely need to click on the lock in the bottom left to make these changes.